GBA Metroid: Zero Mission (USA) in 33:07.53 by Dragonfangs. 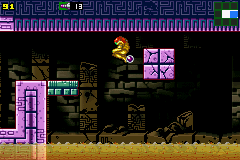 Metroid: Zero Mission is a retelling of the original Metroid's story with a couple of new plot twists and updated gameplay. This movie is a long-awaited improvement to the 1st GBA TAS by BoltR. Much of the almost 3 minute improvement came from a different route (Kraid was fought before Ridley), increased precision, the lack of emulator lag*, and other tricks explained in the author's comments. The in-game clear time is 0:21:39. The item collection rate is 22%. * — The previous version was done before lag reduction was programmed into VisualBoy Advance, so the movie times aren't directly comparable.